PCUnlocker is the ultimate utility for resetting windows password or bypassing the password when you forget your password somehow. It's available in 3 different editions: Standard, Professional and Enterprise. We would recommend you to go with Professional edition as it satisfies issues for most of the users. You may need to reset existing Windows password for many reasons. Some of the common cases can be portrayed as such sneaking into a computer (Yours or other’s) using a different password, administrator password is expired in Windows or disabled, to reset password of Windows active directory, mistyped the password excessively ended up with locked Windows account, and simply forgot the Windows password you have set last time. Forgetting the existing password is one of the most common cases and this happens mostly with newly set password. Yes, when you set a new password and unintentionally missed to keep it in mind, you are prone to forget it. The passwords that have been used for a long time are hard to forget. Anyways, regardless of the situations, you may regain access to your Windows PC using the PCUnlocker utility. 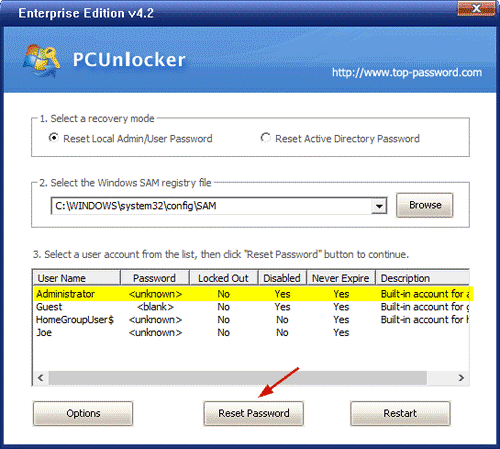 And, in case you are concerned about forgot Windows password, we are sharing the ultimate guide to reset forgotten Windows password in minutes using the PCUnlocker tool. What do people do generally when they forgets Windows password? Reinstalling Windows machine is the option suggested by many. In this case, you will need to buy a Windows installation disk and follow the time consuming procedure to reinstall the Windows ecosystem on your PC. While doing this, you should also take care of your existing data as well. PCUnlocker on the other hand, gets done the job without any charge or risking your existing computer data in a quick and simplest way. Putting things at place, PCUnlocker is the best solution we have. And, we have more reasons to opt for PCUnlocker tool so far. # Needless to mention, this tool will help you reset forgotten Windows PC password. All you need is downloading and create a bootable USB, CD, or DVD and run the tool on your PC. # The PCUnlocker program also comes with a wide compatibility. It supports all Windows versions Windows OS 2000, XP, Vista, 7, 8, 10 including Windows Server OS 2003 R2, 2008 R2, 2012. # It support NTFS, NTFS5, FAT16, and FAT32 file system. Also, it works with .iso, .vhdx, .vhd virtual hard disks and support SAS/SCSI/IDE/SATA/TAID hard drives. # On Windows 10 and 8, it can reset Microsoft account password as well as local account password. # If you don’t want overwrite your existing password, you can simply bypass the password using this tool to access Windows computer. # You may promote any Windows user account to the administrator account with the help of PCUnlocker. # This tool is used for enabling or unlocking Windows account if that is disabled, expired, or locked. # Using PCUnlocker, users may reset or change password for domain administrator, and Active Directory Account besides resetting forgotten Windows password for local or administrator user. As you can see PCUnlocker provides so many things as long as resetting your PC password is concerned. It comes with a very decent user-interface. If you are looking for only the way to reset forgotten password in Windows, the free version of PCUnlocker will work just fine. Some of the features are available with premium registration that cost you more-less $30. If you are good with the feature we have listed here and wise to try out this tool on your Windows 7/8/10 (32/64-bit), we will show you how to get it done step-by-step. First of all, you will have to use an alternative computer to buy/download PCUnlocker tool that is available in .zip format. 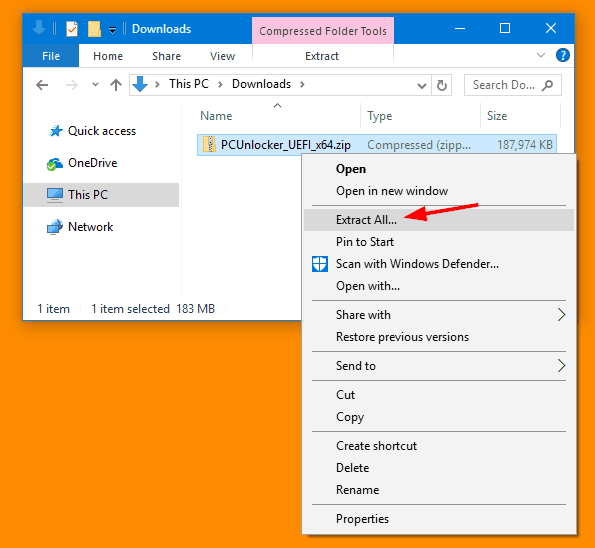 If you are on alternative Windows computer, you may use WinZIP tool for PC or ZIP Extractor extension for Chrome. 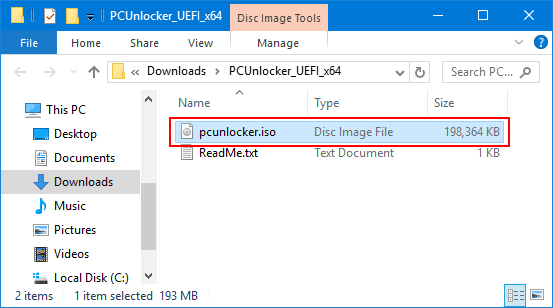 These programs will help you unzip the .iso file of PCUnlocker and save on your PC. After you unzip and save the pcunlocker.iso file, you will have to make a bootable hardware. Use ISO2Disc tool or MagicISO for making bootable USB, CD, or DVD. MagicISO works for making bootable USB Drive too. Using ISO2Disc: ISO2Disc is free to download and use on PC. When the tool is installed you will be prompt to choose either to burn the .iso file to CD/DVD or USB Flash Drive. Here you will also have to locate and select the .iso file through Browse option. When your .iso file is selected and ready to burn, make sure that your Flash drive is empty and properly inserted to the computer. Hit the “Start Burn” and then “Yes” button to continue. When done, click OK. Using MagicISO: MagicISO is also a free tool, easy to use on PC. This tool can be used for backing up CD or DVD to hard disks, making bootable CD and DVDs, etc. When your bootable drive is ready with PCUnlocker in it, you can now proceed to next step. 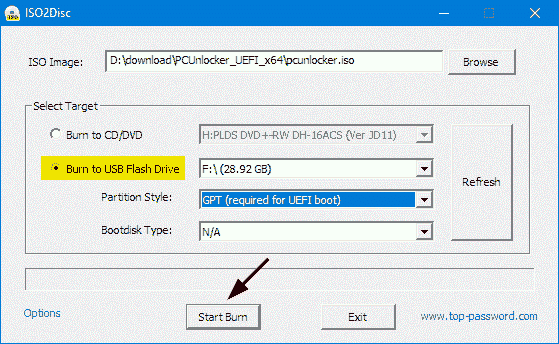 Plug the bootable USB or insert the CD/DVD into your locked Windows PC. 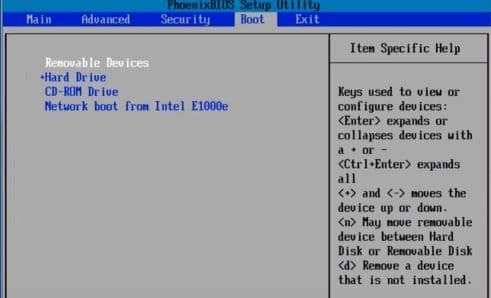 Turn on your computer access to UEFI or BIOS. This can be done in several ways. On Windows 10, if the system is already power on, Press+Hold the SHIFT key and click on Power icon and then click to Restart. Alternatively, while your machine turns on press the F2 or DEL or F8 key according to your PC Company or device model. This is done to access BIOS setup menu. 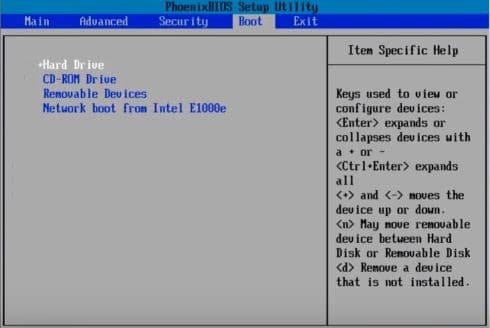 Once you are inside the BIOS Setup menu, use your Arrow keys (Left/Right) to go to the Boot section. After that, use the Plus (+) or Minus (-) key to bring the “Removable Devices” option on the top. If you are using Bootable CD/DVD, use the Plus and Minus keys to choose the Boot Device [CD/DVD] option under the BOOT menu. Finally hit the “F10” key to save the settings and exit the BIOS menu. Select “Yes” option and then Hit Enter key. After exiting from the BIOS setup menu, your system will boot from the password reset tool instead of the default boot loader. On this point, you can either choose to “Reset Local Admin/User Password” or “Reset Active Directory Password.” Select the first option and then opt the SAM registry file navigating C:\Windows\system32\config\SAM. All the available user accounts in your PC will be shown in list. Here you need to select the right account to reset forgotten Windows password. Once your account is selected, click on the “Reset Password” button followed by “Yes” option to confirm the action. Finally “Restart” your PC to confirm rest password. Your existing forgotten password will be reset immediately and you will be now able to login to your computer without any password. You can set a new password afterwards. That’s it. It’s easy to reset password and login back to your computer when you have forgotten the existing credential. This time, make sure to remember the password. Nevertheless, if you forget the password again, PCUnlocker is going nowhere. Hope this guide has helped you regaining access to your Windows computer running on Windows 7, 8, or 10. Feel free to utilize the comment box if anything further is required.